This dish is a take on the standard Thai chicken curry but for me, it packs more flavour and has a tropical touch. It is based on a recipe from the BBC Good Food magazine and I strongly recommend you to try it! Simple to cook though you need to get all your prep done carefully first so it is all ready to go! Heat oven to 200C / 180 c fan. Heat a good splash of oil in a shallow casserole or high sided pan that can go in the oven I use a stoneware one, see pic, which is ideal. Fry chicken thighs skin side down til well coloured then remove and put to one side. They will take on a deeper colour in the oven so do not fret. Fry the onion in the same pan til soft and coloured- add the garlic, ginger, turmeric, cumin and chilli. Cook for 2 minutes, then stir in the cauliflower and squash. Add the rice, half the coriander, the lime zest and half the lime juice and a little seasoning. Put the chicken back in the pan on top skin side up this time! Add a little more black pepper to them. Heat the coconut milk and stock together gently til just about to boil then pour this around the chicken. Pop the pan uncovered into the oven for 40 minutes or until the liquid has been more or less absorbed and the rice is as you like it. Remove from the oven and add the remaining lime juice and coriander, mixing it in a little amongst the chicken. Serve and enjoy! Spring meets India meets salmon…..meets my needs! A fab way to eat hot smoked salmon and asparagus with a cheeky hint of lime! Fine for 4 – or a good supper for 2 with a little for the next day! Pop the rice into a large heavy-based saucepan, pour over 700ml pints water and sprinkle in a good shake of salt. Cover and bring to the boil, then remove the lid and allow all the water to be absorbed – this should take about 15 minutes. Turn off the heat, cover again and allow to steam dry. Melt half the butter with the oil in a large frying pan. Stir in the curry paste or powder and cook until you start to smell the wonderful aromas. Once the rice is cooked add the curry and onion mixture and quickly stir to make sure all the buttery juices are absorbed and the rice is heated through. Now mix in the salmon, eggs, asparagus and lime juice. Stir gently, add the herbs along with cubes of the remaining butter and serve in warm bowls. A truly tasty and satisfying dish for a Spring weekend. This super simple supper dish is a perfect way to eat pork tenderloin. You can choose to spice it up as much or as little as you want depending on your tastes and it is a great dish to add your own touches too. 1. Heat the oil in a large, non-stick deep frying pan or sauté pan. Fry the onion wedges over a medium-high heat for 3 minutes until they’re softened and lightly browned, stirring regularly. 2. Season the pork with salt and black pepper, then add it to the pan and stir-fry with the onion for 2 minutes until lightly browned. Add the chorizo, garlic, peppers and beans and stir-fry together for 2 minutes more. Sprinkle with the spices and stir in the rice, then pour over the stock and bring to the boil. 3. 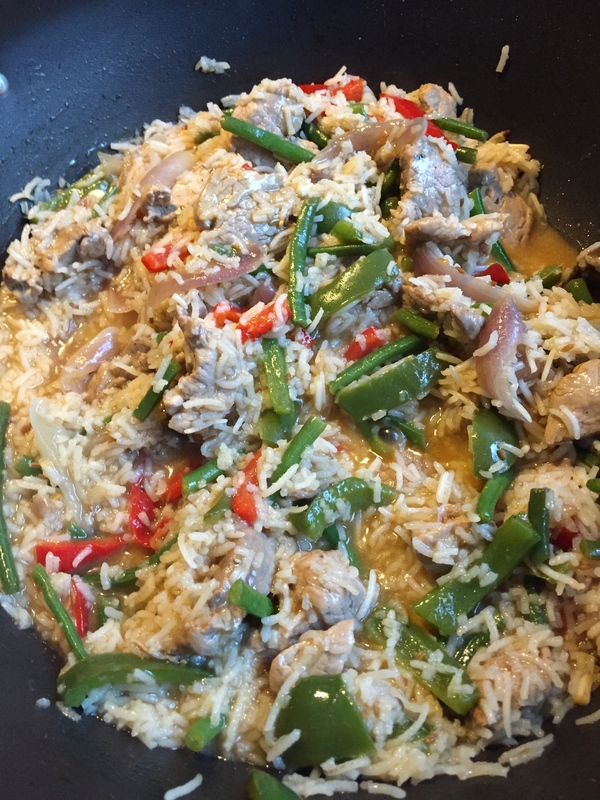 Reduce the heat to a simmer and cook for 20 minutes, stirring regularly, until the liquid has been absorbed and the rice and pork are both lovely and tender. 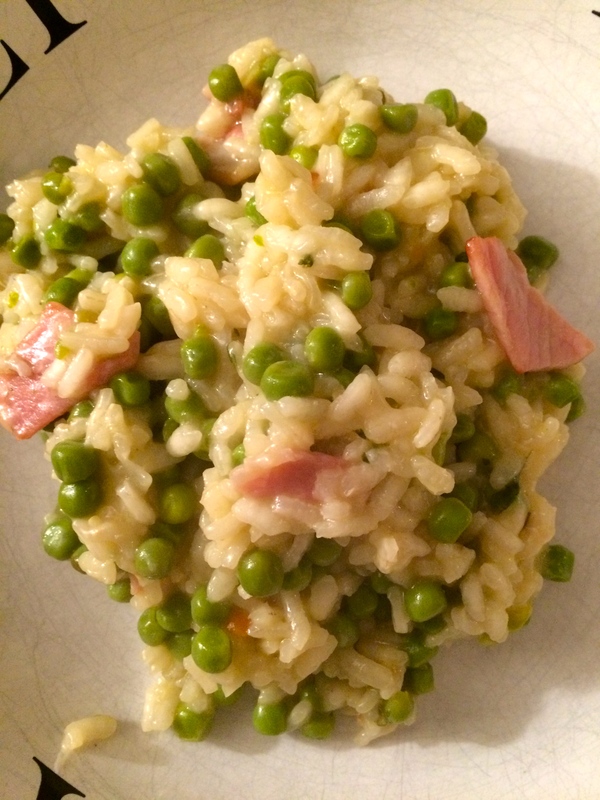 This is a great dish for your kids to try out – get them in the kitchen and get them cooking! 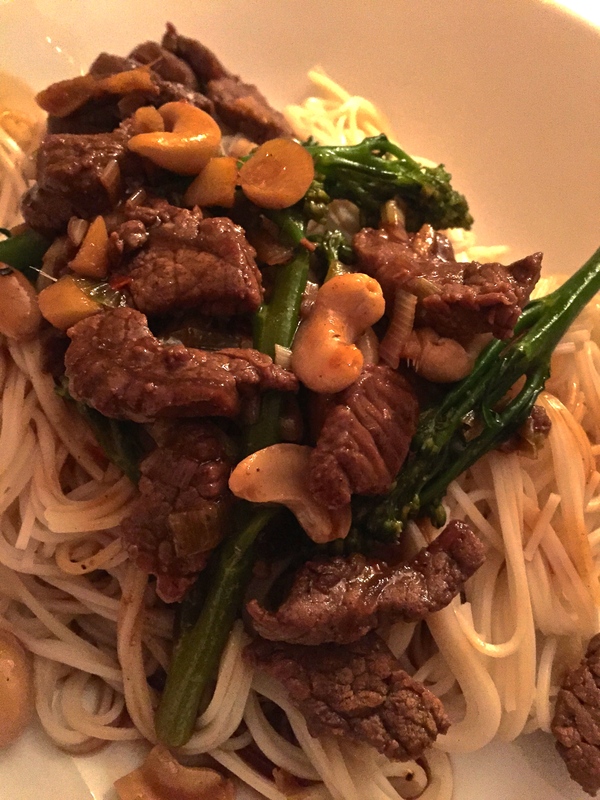 I love Chinese food – I should cook more of my own recipes really.Once you have the basic ingredients in your store cupboard then the dishes are fun and simple to create. This recipe is perfect for novices of this cuisine – the resulting flavours are mouth watering. You could use sirloin steak if you feel flush, but frankly, any decent frying steak will do just fine. Noodles to serve – I like the thinnest I can get. Mix the soy sauce and Chinese 5 spice with a grind of black pepper in a bowl – add the beef and coat it all in the mix. Put to one side. Heat 1 tbsp of oil in a wok or large frying pan – one with a lid – over a high heat. Add the beef and stir fry for 2 to 3 minutes. Remove the beef from the pan on to a warmed plate. Heat half a tbsp of oil in the pan again and add the garlic, ginger, chilli flakes and cashews. 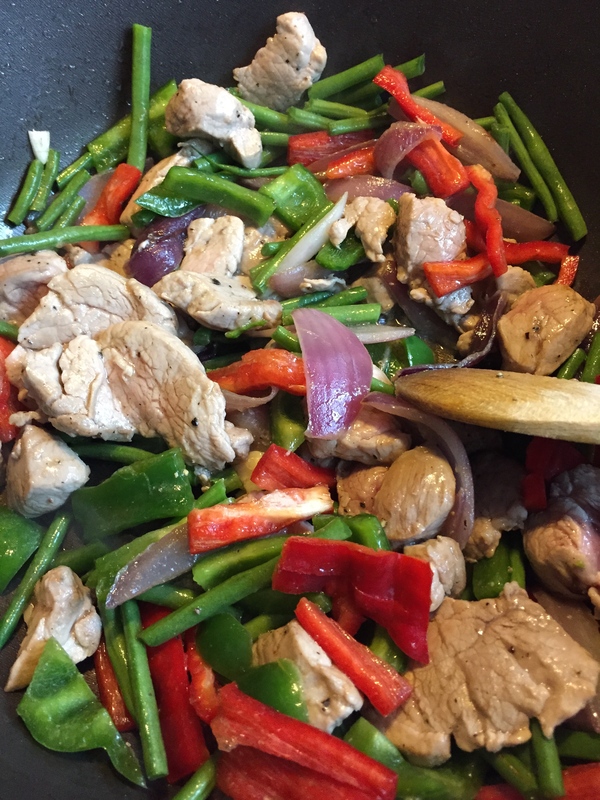 Stir fry for one minute on a high heat. Add the oyster sauce and the water – stir. Bring to the boil, add the broccoli, then reduce the heat to a medium heat, pop on the lid – or cover with foil if no lid – then cook for three minutes. Return the beef to the pan to warm through. Add the juice of half the lime and the spring onions. Serve with noodles and the rest of the lime in wedges. You will love this – I promise! This was a treat to make and the result was simply stunning. 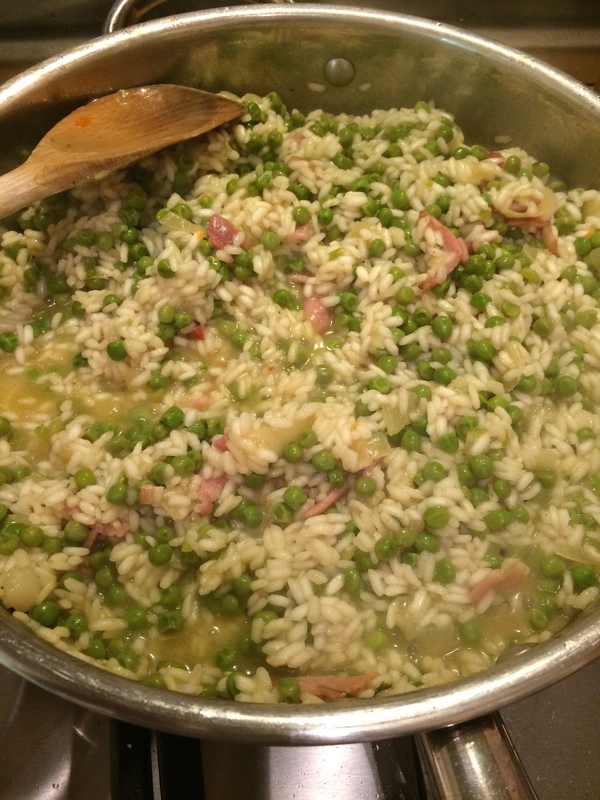 My son reckons he will never eat any other risotto now and my daughter wants this dish as a regular on the menu roster. It went down well! Melt the butter in a thick-based pan and gently cook the onion without colour until it is soft. Add the rice and stir to coat all the grains in the butter. Add the wine and cook gently stirring until it is absorbed. This takes about 5 minutes roughly. Gradually add the hot stock, a ladleful at a time, stirring until each addition is absorbed. Keep stirring until the rice is tender. This process will take about half an hour, so put some good music on – maybe some Chet Baker – and get into a comfortable standing or seated position near the cooker! 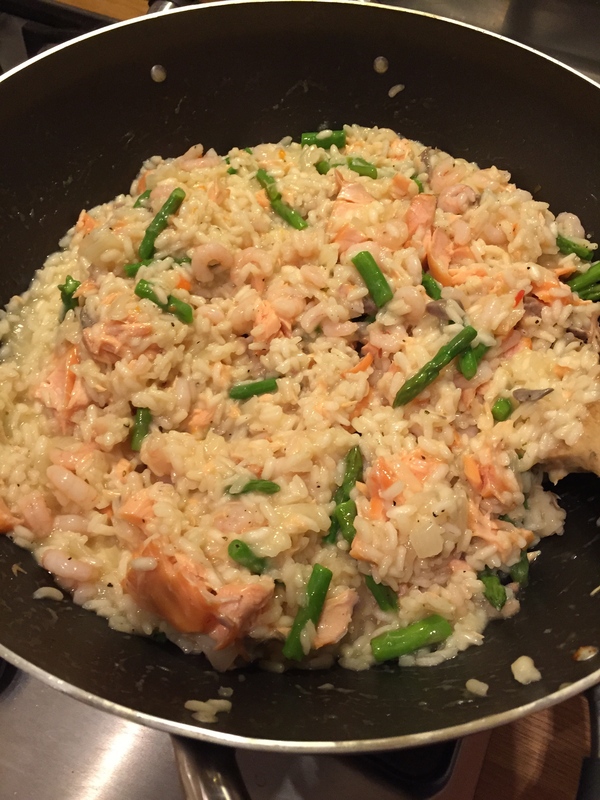 Flake the salmon and gently fold into the risotto with the prawns and asparagus – this will be right near the end when the rice still has a little bite to it. Stir gently to heat through. Serve with lemon wedges. Of all the dishes I have put on here in the last two years this is certainly one of my real favourites. Please, please give it a go! Risi e bisi…. it’s easy peasy! This is one of those dishes that I have been meaning to get around to cooking for a while….I should have made it before – it is delicious! Simplicity itself and considering the basic ingredients the result is remarkable. It satisfies the soul and calms the beast. It is awash with flavours. Melt 40 gm of the butter with the oil in a large sauté pan and fry the onion and pancetta for 5 minutes, stirring now and then, Add the peas with the parsley, and 2 ladlefuls of the hot stock. Simmer for 15 minutes – no lid – until the stock has evaporated. Add the rice and stir gently on a medium heat for 2 minutes. Pour in 500 ml of the stock and continue to cook, stirring occasionally. As soon as the water has been absorbed add more stock, a ladleful at a time. Cook for 20 more minutes until the risotto looks a little like soup and the rice is cooked but still has a bite to it. Remove the pan from the heat and stir in the remaining butter and parmesan. Cover with a lid and leave to rest for 3 minutes. Serve in warmed bowls and drizzle on a little olive oil at the table. Autumnal bliss in a bowl. When judgment day comes and someone high up in the angelic ranks is weighing everything in the balance, risotto will be marked down as one of the dishes that mankind got right. It is almost fool-proof….as long as you are patient soul. It rewards you with one of the most flavoursome, fulfilling dished that has ever hit a plate-anywhere! This was lunch today. It was a joy to make and a pleasure to consume. It hit every spot that Eros has thought about. 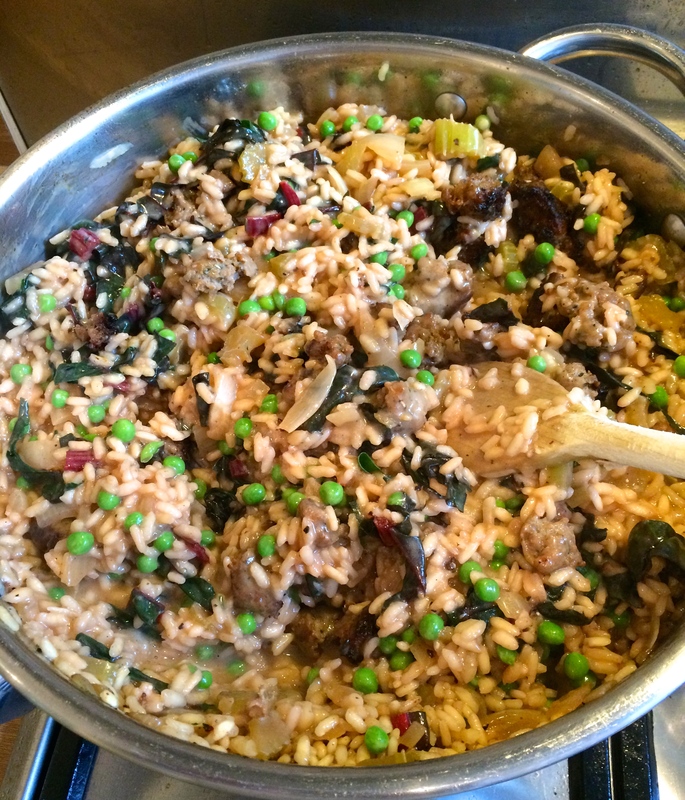 You may have worked out by now that I am navigating my way through a marvellous book by the wonderful Gino D’acampo and this is my take on his risotto al radicchio rosso e salsiccia. I was fresh out of radicchio but I substituted some sumptuous red swiss chard that was passing the time of day in my fridge. It was a great substitute. 1. Heat the olive oil and 25 gm of butter in a large sauté pan on a high heat and add the sausage. Fry until golden brown, breaking it up along the way with a wooden spoon. Remove with a slotted spoon to a plate lined with kitchen paper and keep warm. 2. In the same pan, add the onion and celery and fry gently for 2 minutes. Add the rice and allow to toast in the pan for 3 minutes. Stir continuously and then pour in the wine. Continue to cook for a further minute. 3. Add 2 ladles of the hot stock and bring to a gentle simmer. Continue doing this for about 15 minutes – adding a ladle of stock, stirring continuously each time until it has been absorbed. It will be ready when all the stock apart from a ladleful has been absorbed and the rice is al dente. 4. Add the peas and chard, or whatever you are using, and add a final ladle of stock – remove from the heat and stir in the remaining butter and the Parmesan. Once the butter has melted, add three quarters of the cooked sausage and stir in. 5. Serve straight away on plates and add a little drizzle of olive oil to each and a smattering of black pepper. A winner of a dish for a Sunday…indeed any day. This is a simple and phenomenally tasty supper dish, perfect for an autumnal Friday. Healthy and filling too. For each person, pop a decent salmon fillet, skinned, into an oven dish and drizzle over a good teriyaki sauce. Bake in the oven for 15 minutes at 160c for a fan oven, 180c if not. 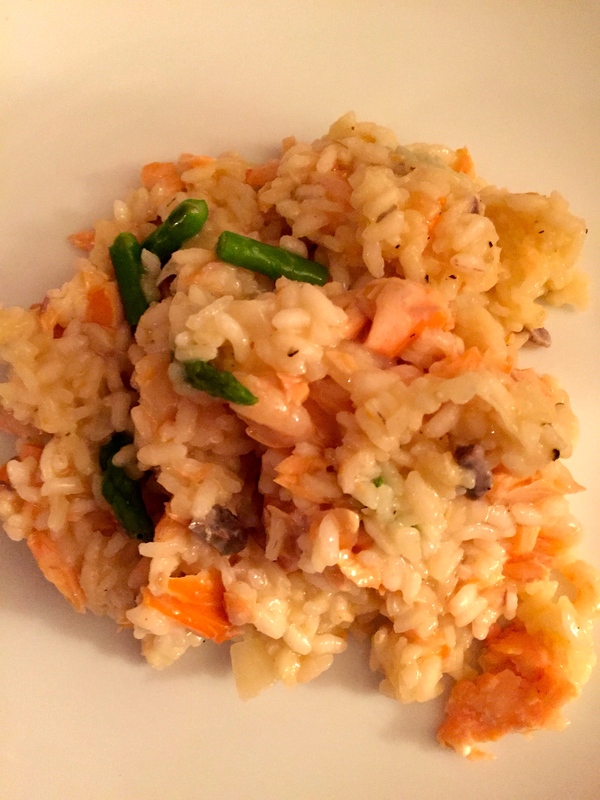 Cook your rice – I use basmati cooked in a ceramic rice cooker. In a frying pan tip two or three tablespoons of olive oil – heat – then add two finely chopped and deseeded long red peppers, one finely chopped red chilli, and two chopped cloves of garlic. Fry for around ten minutes on a medium heat, then add 100 gm of finely chopped fresh spinach. Cook for a further 5 minutes. 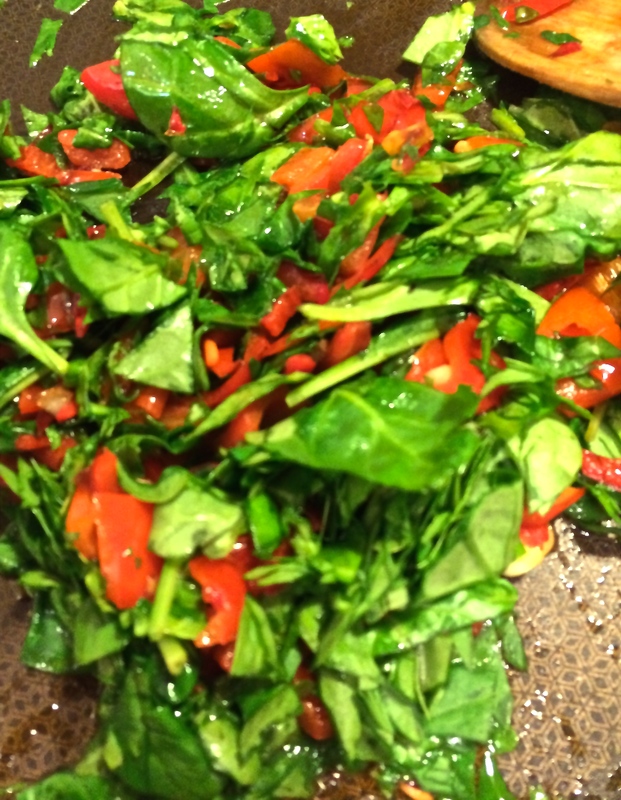 Pour the drained cooked rice into a bowl and gently stir through the pepper and spinach mix. 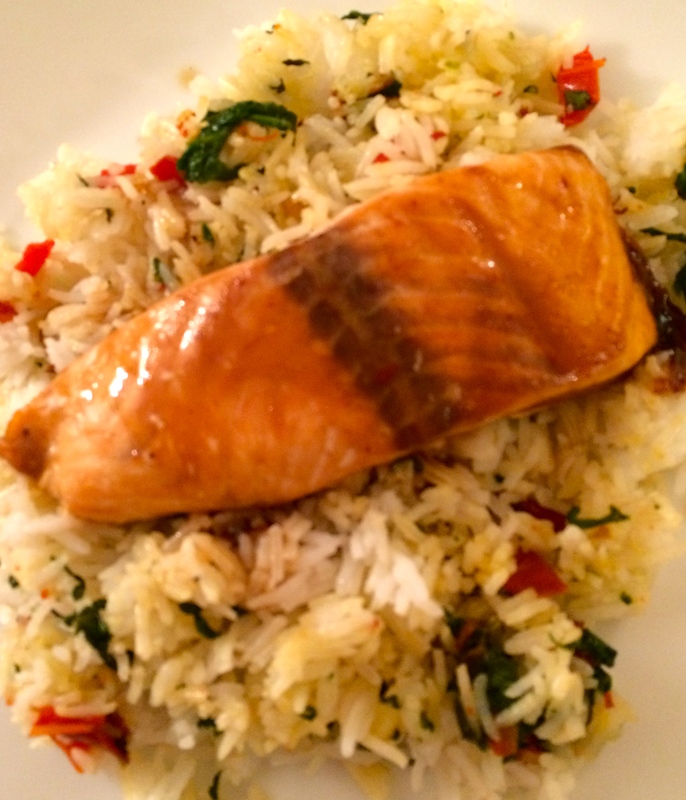 Share the rice between plates and add a fillet of the salmon. Drizzle with some of the teriyaki sauce and serve. This is such a marvellous match of flavours. It just works so well. Salmon and September on a plate! Chilli is an evocative word – just like this painting of Bonnie Lalley‘s – it conjures up warmth, spice, something primeval and yet oddly comforting – a little like watching a horror movie – you know you shouldn’t watch but you do – it is a no holds barred experience – a recipe not to undercut or do on the cheap, a no corner cutter – you need to take the cushion away from your face and go in eyes wide open – there may be scary moments ahead – especially if you are free and easy with the chillies – but hang on in there – the ride will be worth it. I have put this out there before – but I want to remind you all once again that this is a serious dish – to treat with respect and to meet the meat head on. I saw Bonnie’s painting and I knew I had to return again to the thriller that is the Full Meat Chilli Chiller! Heat oil in large pan. Brown all meats in batches. Transfer to a large stock pot or casserole dish. Add more oil. Sweat onions on a slightly lower heat until a little brown. Add to meat along with all other ingredients except the beans and coriander. Bring to the boil and simmer gently. Cook for at least an hour – I usually leave it for at least an hour and a half. No lid! Add the beans for last twenty minutes. Taste – adjust seasoning – maybe just black pepper – I have never had to add salt. Add the roughly chopped coriander just before serving and stir through. Serve with rice – I put a little turmeric in mine. And a pot of soured cream. Or you could serve with naan bread or tacos or crusty bread – or even a baked potato. This is a demon of a dish – a veritable feast of flavours. Not for the faint hearted. One for the connoisseur of heat and meat. Merguez is a vibrant, spiced lamb sausage of North African origin, adopted by the French who make so many wonderful variations of it. Ingredients, apart from the lamb ( it was originally mutton) are usually cumin, and either chilli pepper or harissa (which give the sausage its warm red colour) and garlic and sometimes fennel. Normally I have to wait to cross the channel to indulge my love of these beauties… but hey…those lovely folk at Parsonage Farm in Upton, Hampshire (see their website) now make their own! And they are really, seriously good! zingy back drop to allow their flavours to come through. I must have been in cowboy mode – I felt like creating a supper dish redolent of camp fires, coyotes howling, and gunslingers nestling down under a tree to hum songs of life on the dusty trail….ok…maybe a bit much…. 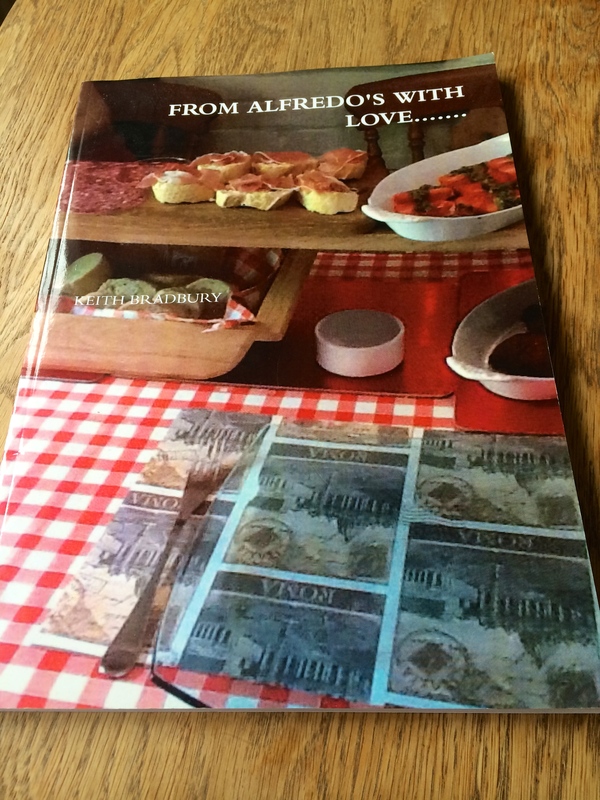 I had to rely on what was in my store cupboard – no shopping had been done due to a busy, busy day. So, into a hot frying pan I added a splash of olive oil which I heated. I chopped 6 baby new potatoes into cubes, added them to the pan with a sprinkle of dried chilli flakes, a chopped clove of garlic and a teaspoon of cumin seeds. I left this to sizzle on a low heat for 15 minutes, then added a chopped red pepper and left it for another 10 minutes on a medium heat. By now the spuds were looking nice and light gold so I pushed the mixture to one side and added the merguez to the pan. I let them cook for about 10 to 12 minutes turning all the time on a medium heat. The beauty of this was that the fabulous, unctuous redness from the merguez ran into the pan…so when I removed them and put them to one side, I could bring all the other ingredients back into the mix and they were infused with the flavour of the merguez. I now added a 400 gm can of chopped tomatoes, a hearty dollop of tomato paste (you can use just as happily a dollop of a good quality tomato ketchup) and a can of mixed beans – borlotti, cannellini, red kidney, white haricot and pinto. Just the job for a ranchero! This all melded together to create a warm, rich sauce as a backdrop to the mouthwatering merguez. 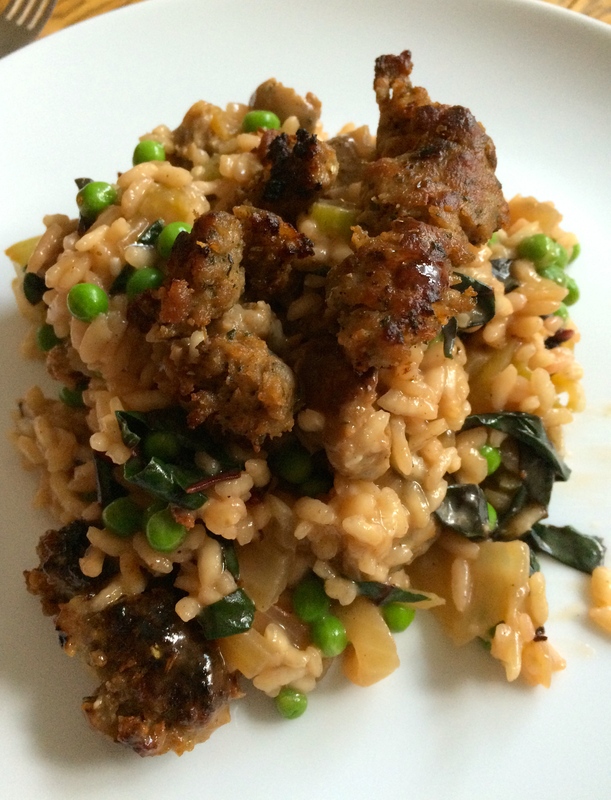 I popped the sausages back on top of the sauce to bring to the table – and I served it with some sticky, saffron rice which soaked up the juices just swell ( oh dear…cowboy parlance taking over now!). As the camp fire faded and the coyotes sang their mournful tune to the moon, I savoured the last lingering flavours of the mighty merguez and sat sipping a glass of shiraz until the doggies retired….well, actually,…… until I had to put the cat out….